My friend laughed. Saying to me, “Shruti, if you are old, then I am ancient!” My friend is in her seventies. I too rolled my eyes as this is a common remark about me in India (I am in my fifties). And why? Not that I look my age, even if I say so myself. But because I sport salt-and-pepper hair, more salt than pepper, I might add. 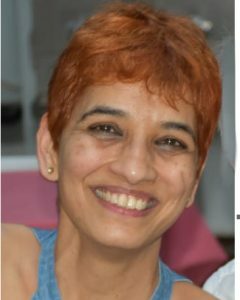 Having openly grey hair at any age in India is folly, an open declaration that now you have crossed that hill from where there is no going back – in short a no-no. 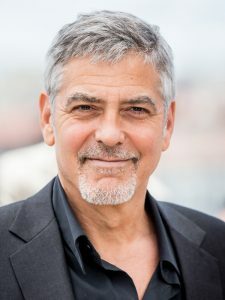 Even though in the East silver/grey hair signifies age, seniority and wisdom, men and women tend to colour their hair soon after it starts to turn grey. Initially henna – a plant known for its conditioning and orange colouring properties and its use on hands and legs – is used. However, where that might work for a few strands of white adding sheen and a delightful auburn tint, a full head of silver hair turns into a flaming, bright orange! Men are even known to dye their beards and moustaches with this wonderful green leaf powder which then miraculously turns their hair a deep auburn or a bright carrot orange. In India, I notice men seem to colour their hair too, no matter what age they get to. Short cropped hair, long locks – no matter how old a man or a woman is, the temptation to use the bottle is very prevalent. Whereas in the West, men proudly sport their grey, starting at the temples and as they begin to go greyer they come to be called ‘distinguished’ or ‘Silver Fox’. Now picture this scenario: ‘Wow! I love your hair!’, ‘Where did you get it done?’ or ‘What do you do to your hair to get it like this?’ These remarks are often said to me when I am in the West – UK or Europe. Or by Westerners in India. I have also been called the Silver Vixen! Initially I used to be flattered when I received the above comments in the West and miffed when I was called an ‘old lady’ in India. And then I began to think about cultural differences. How we are perceived – the stereotypes we adhere to, the safety in numbers and the fear or stigma of breaking out of predetermined moulds. However, nowadays more and more women in the West are into what is called – ‘#greynaissance‘. This article explains it all. As both women and men embrace being natural, ageing gracefully seems to be rising in stakes. This can also be a backlash against all the unnatural treatments that have been prevalent thus far like Botox, Restylane and more of the same as a means of looking unnaturally young late in one’s life. Older models too are more visible on the catwalk and magazines and proudly so! Grey hair and all. So it looks like I have been at the vanguard of this #greynaissance for a few decades now as I began greying quite early in life. One interesting cultural anomaly is that traditionally, the elders are more revered here [in India] yet signs of that very ageing are more looked down upon. How strange is that! And how, due to these sometimes self-imposed constraints, all of us restrain ourselves, suppress our impulses and our innate originality into tiny compartments of our minds, only to examine them in solitude, if at all. This pressure to conform is immense and starts from childhood. This was one of my earliest learning lessons as a child, because I stood out for a variety of reasons – being unusually thin, tall and gawky, my long, unruly, curly hair hinting at my inner nature. Bookish and a nerd, I was socially self-conscious and wanting to be liked and accepted, so I did my best to blend in. However my unusual schooling in a J. Krishnamurti school meant that I was allowed to express myself to the full extent of my personality albeit tempering it with a sense of responsibility. So what do I do with my hair then? Conform and blend in? Or boldly stand out? Cussed and pig-headed that I am, and as a total mark of respect to J. Krishnamurti, while I proudly sport my silver-vixen look most of the time, I go further and from time to time colour my hair purple or green or blue. And then wait and watch for the comments!